Standing Room Only for this Year’s HHHTA Family Movie Day by Suzann Schmanski – Half Hollow Hills Teachers Association | Love what you do. 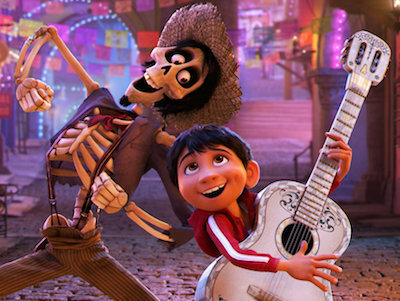 A boy following his dreams, the Mexican tradition of the Day of the Dead, and a journey through a family’s past were all brought to life in Pixar’s movie Coco, the film selected for this year’s HHHTA Family Movie Day. The HHHTA Family Movie Day was a huge success. Every seat in the theater was taken. Coco was a movie people of all ages could enjoy. Viewers were captivated by the story of a young boy following his passion for music despite his family’s opposition to this path. His passion took him into the Land of the Dead, which unveiled parts of his family history he never knew. From the movie Coco, one learns many important life lessons. One lesson is to be courageous enough to follow your dreams. Another lesson is the importance of honoring, respecting and remembering your family. Finally, the movie touches upon forgiveness as Miguel, the main character, searches for his great-great-grandfather and the past relationship between his great-great grandfather and great-great grandmother is revealed. HHHTA Family Movie Day brought teachers and paras throughout the district together with their children for a fun-filled morning. It was wonderful to see so many members take advantage of this opportunity.